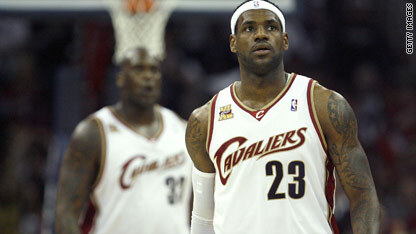 [Posted 2:26 p.m.]Two-time MVP basketball superstar LeBron James is on the cusp of free agency. In an interview scheduled to air Friday with CNN's Larry King, James said his current team, the Cleveland Cavaliers, has the best chance of keeping him. KING: ... your home team? JAMES: Absolutely. Because, you know, this city, these fans, I mean, have given me a lot in these seven years. And, you know, for me, it's comfortable. So I've got a lot of memories here. And - and so it does have an edge. James has not talked to the media since the Cleveland Cavaliers were eliminated in the second round of the playoffs by the Boston Celtics. Two years ago the Cavs began setting up for the 2010 free agent market. Most of the current contracts were written expressly with clauses that left this year optional. Therefore there is plenty money available to sign other big name free agents. With the addition of perhaps C. Bosh & D. Wade, with J.Calipari at the helm the Cavs stand to become a dynasty. I hope whatever he does, he does for himself. Hes incredible. But Kobe will always take it in my book.